Adding and managing products in your online store is a straightforward process and similar to authoring a standard WordPress post. When you login to your account you will see the Products menu (on the left side of your screen), click Add Product. You will be presented with a familiar interface and should immediately see where to type the product title and full description. With attributes and categories set up and stock management configured, we can begin adding products. When adding a product, the first thing to decide is what type of product it is. 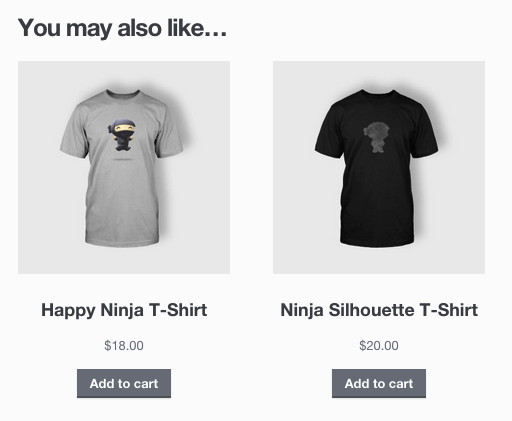 A Simple product type covers the vast majority of any products you may sell. Simple products are shipped and have no options. For example, a book. A Grouped product is a collection of related products that can be purchased individually and only consist of simple products. For example, a set of six drinking glasses. An External or Affiliate product is one that you list and describe on your website, but is sold elsewhere. A Variable product is a product that has different variations, each of which may have a different SKU, price, stock options etc. For example, a t-shirt available in different colors and/or sizes. Under the main dialog box is the Product Type panel. Here you define the product type (as outlined above) and whether it is a downloadable (digital) or virtual (service) product. SKU – SKU means stock keep unit, it is used to track products. Must be unique, and should be named so it does not clash with post IDs. Regular Price – Item’s main price. Sale Price – Item’s sale price. The inventory tab allows you to manage stock for the product individually and define whether to allow back orders. If stock management is disabled from the settings page, only the ‘stock status’ option will be visible. Checking the Sold Individually box limits the product to 1 per order. Weight – Weight of the item. Dimensions – Length, width, and height for the item. Shipping Class – Shipping classes are used by certain shipping methods to group similar products. Up-sells are displayed on the product details page. These are products that you may wish to encourage users to upgrade, based on the product they are currently viewing. For example, if the user is viewing the coffee product listing page, you may want to display tea kettles on that same page as an up-sell. Cross-sells are products that are displayed with the cart and related to the user’s cart contents. As an example, if the user adds a Nintendo DS to their cart, you may want to suggest they purchase spare Styluses when the arrive at the cart page. Grouping – Set this option to make a product part of a grouped product. 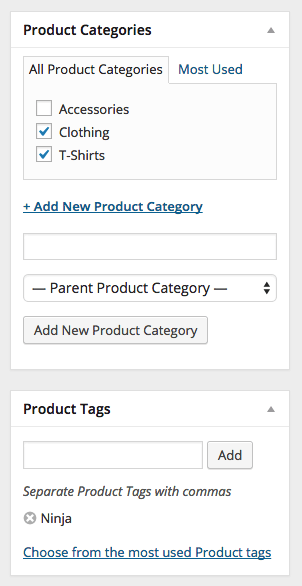 On the attributes tab, you can assign attributes to a product. You will see a select box containing global attribute sets you created (e.g., platform). 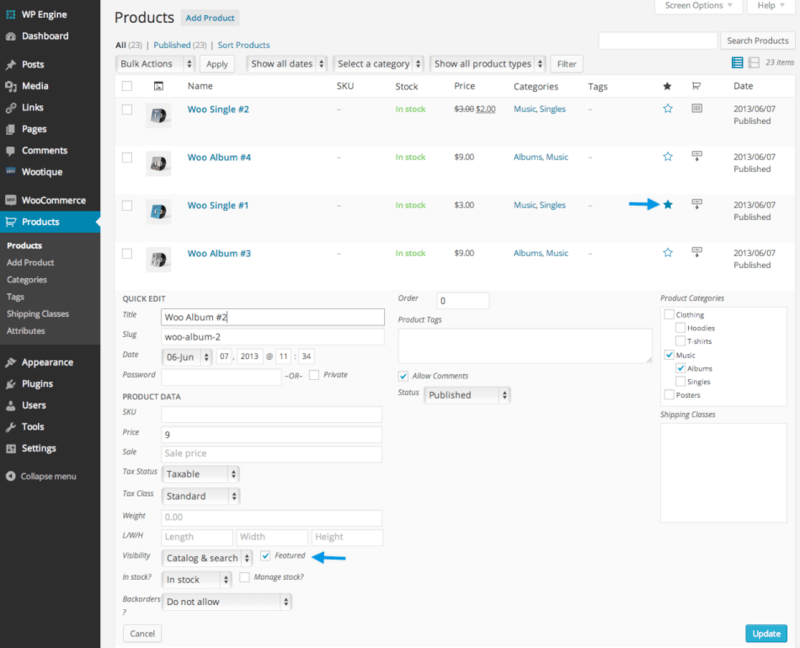 See Managing Product Categories, Tags and Attributes for help on setting these up. Once you have chosen an attribute from the select box, click add and you can apply the terms attached to that attribute (e.g., Nintendo DS) to the product. You can hide the attribute on the frontend by leaving the Visible checkbox unticked. Custom attributes can also be applied by choosing ‘Custom product attribute’ from the select box. These are added at the product level and won’t be available in the layered navigation. Purchase note – Enter an optional note to send the customer after purchase. Menu order – Custom ordering position for this item. Finally, you can add an excerpt that should be a short product description. Typically this appears next to the product imagery on the listing page, and the long description appears in the Product Description tab. On the right hand side of the Add New Product panel, there are product categories in which you can place your product, similar to a standard WordPress post. You can also assign product tags in the same manner. You can add both a main image and a gallery of images – see Adding product image and galleries. 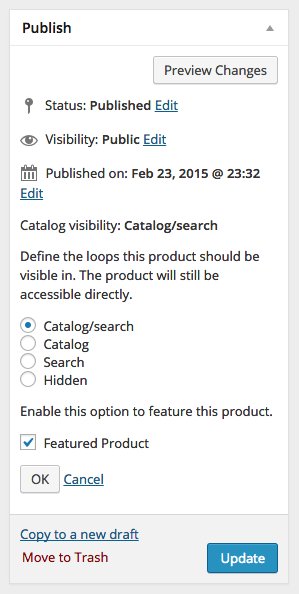 In the publish panel, you can set catalog visibility for your product. Upon setting the parent product as Grouped, the price and several other fields will disappear. This is fine because you’ll add this information to individual child products. Once you’re finished with the parent product, publish it and come back to the Add New Product page. If you wish to control the order in which products are shown within a group, edit the Menu Order option under the Advanced section in product data. When adding a simple product, you can check the virtual box in the product type panel. This will remove unnecessary fields, such as dimensions. File path – path or url to your downloadable file. Download limit – a limit for the number of times the customer can download the file. Left blank for unlimited downloads. For maximum flexibility, downloadable products also incur a shipping cost (if, for example, you were offering both a packaged and a downloadable version of a product, this would be ideal). You can also check the Virtual box if the downloadable product is not shippable. Note: If the Completed Order Email doesn’t contain downloadable links, see this Troubleshooting Guide. Choose ‘External/Affiliate’ from the product type dropdown. This removes unnecessary tabs, such as tax and inventory, and inserts a new product URL field. This is the destination where users can purchase the product. Rather than Add to Cart buttons, they see a Read More button directing them to this URL. Variable products are arguably the most complex of product types. They let you define variations of a single product where each variation may have a different SKU, price or stock level. See Variable Product for a guide on creating a product with variations. If you are managing stock on an order and allow backorders in WooCommerce settings, most all payment gateway options will charge immediately. You can use the Advanced Notifications extension to help notify someone other than the shop admin of backorders. If you want to wait to charge customers for an item until the item is back in stock, you can use the Waitlist extension that emails all users, notifying them that the item is back in stock and includes a link to to purchase it.